The Syro-Malankara Catholic Church also known as the Malankara Syrian Catholic Church (Malayalam: മലങ്കര സുറിയാനി കത്തോലിക്കാ സഭ) is an Eastern Catholic sui iuris particular church in full communion with the Pope and the worldwide Catholic Church, with self-governance under the Code of Canons of the Eastern Churches. The Church is headed by Major Archbishop Cardinal Moran Mor Baselios Cleemis Catholicos of the Major Archdiocese of Trivandrum based in Kerala, India. The Church follows the West Syriac Rite liturgy of Saint James, which is also used in the Maronite Church, the Syriac Catholic Church, the Syriac Orthodox Church, and the Malankara Orthodox Syrian Church. The Church traces its origins to the evangelistic activity of Thomas the Apostle in the 1st century. It is one of the two Eastern Catholic Churches from India, the other one being the Syro-Malabar Catholic Church which uses the East Syriac Rite liturgy. The Malankara Catholic Church was established on 20 September 1930 as a result of the re-union movement under the leadership of Archbishop Mar Ivanios, when it split from the Malankara Church and entered into communion with the Catholic Church. The Malankara Church itself had emerged from the split within the Saint Thomas Christian community of the 16th century; previously the entire community had comprised a province of the Church of the East, or the Nestorian Church, based in Persia. However, the collapse of the Church of the East and influence from the Portuguese, who tried to bring them under the Latin Church of the Catholic Church, led to a rift in the community. 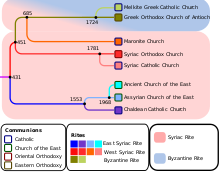 Eventually, the majority entered into communion with the Catholic Church, as the Syro-Malabar Catholic Church, while the rest formed the Malankara Church and aligned with the Syriac Orthodox Church of Antioch. By 1926, a group of five Malankara Syrian bishops who opposed the jurisdiction of the Syrian Orthodox Patriarch in India appointed Mar Ivanios to have negotiations with Rome to enter into a new communion. Rome only required that bishops make a profession of faith and that their baptisms and ordinations be proven valid in each case. However, only two of the bishops accepted this arrangement with Rome, including Mar Ivanios. The two bishops, a priest, a deacon and a layman were received into the Catholic Church together on September 20, 1930. This resulted in a significant movement of the faithful into the Malankara Catholic Church, by 1950 there were some 65,588 faithful, in 1960 112,478, and in 1970 183,490. There are now over 400,000 faithful in over six dioceses in India and across the world. A protest took place in 1653 with the Coonan Cross Oath. Under the leadership of Archdeacon Thomas, the Thomas Christians publicly took an oath that they would not obey the Jesuit bishops. Rome sent Carmelites in two groups from the Propagation of the Faith to Malabar headed by Fr. Sebastiani and Fr. Hyacinth. Fr. Sebastiani arrived first in 1655. He began to deal directly with the Archdeacon, Mar Thoma I. Fr. Sebastiani gained the support of many, especially with the support of Parambil Mar Chandy, Alexandar Kadavil and the Vicar of Muttam. According to Jesuit reports, these were the three councilors of Mar Thoma I who, before the arrival of Sebastiani, were reconciled with Francisco Garcia Mendes, the Jesuit Archbishop of Cranganore, one of the Latin rite sees in Kerala, . Between 1661 and 1662, out of the 116 churches, the Carmelites reclaimed 84 churches, leaving Archdeacon Mar Thomas I with 32 churches. The 84 churches and their congregations were the body from which the Syro Malabar Church has descended. The other 32 and their congregations represented the nucleus from which the Syriac Orthodox (Jacobites & Orthodox), Thozhiyur, Mar Thoma Syriacs, Syro Malankara Catholics originated. In 1665 Mar Gregorios, a bishop sent by the Syriac Orthodox Patriarch of Antioch, arrived in India. The dissident group under the leadership of the Archdeacon welcomed him. Though most of the St. Thomas Christians gradually relented in their strong opposition to the Western control, the arrival of the Bishop Mar Gregory of the Syriac Orthodox Church in 1665 marked the beginning of a formal schism among the St. Thomas Christians. Those who accepted the West Syriac theological and liturgical tradition of the Syriac Orthodox Church of Antioch of Mar Gregory became known as the Jacobite, The Syriac Catholics remained in communion with Rome and later came to be known as the Syro Malabar Church. the faction resisting the Patriarch's administrative interference became the Malankara Orthodox Syrian Church, an autocephalous Church under its head the Catholicos. Baselios Paulose I (1912–1913), the first Catholicos, died after a short period of five months on 13 May 1913; the See remained vacant until 1925. That was a period of litigation in the Malankara Church. The litigation for Vattippanam (a fixed deposit of money in the name of the Church) and its after-effects in the community was at its zenith. Geevarghese was born on 21st Sept 1882 at Mavelikara to the 'Mallitty' Panickervettil family, belonging to the Malankara Syrian Orthodox Church. He was given the baptismal name Geevarghese. The Panickervettil family were honoured with the title of 'Mylitta Panicker' bestowed upon by the Maharaja of Travancore Marthanda Varma, Travancore Royal Family. Panicker's family lineage also include him being grandson of the aristocratic Saint Thomas Christian family Polachirackal with their tharavad in Mavelikkara. The Polachirackal House held the highest-ranking hereditary title for a Christian family in Travancore being of nobility titled as Tharakan and were of the highest ranking Christian peer to the Maharaja of Travancore. The Polachirackal House through the Saint Thomas Christian Syro-Malankara Catholic Church is acknowledged by Pope Pius XI and continues to do so by the Holy See of the Vatican City as one of the oldest Saint Thomas Christian families with their tradition of origin being that their ancestors who were of a royal lineage from the Chera Dynasty were converted by Saint Thomas in 53 AD and preceding Western Christianity and Christian monarchies in Europe. Starting with the first Portuguese discoveries including that of navigator Vasco da Gama, the House had evolved from accumulating one of the largest wealth through merchant trading from their oligopoly in black pepper commodity trading as part of the spice trade controlled by the Dutch East India during the age of discovery between the 16th and 18th centuries. The House's excessive wealth allowed them to become the court financiers to Marthanda Varma and financed the Kingdom of Venad during the Travancore–Dutch War in the 18th century against the Dutch East India Company. This culminated in funding the Battle of Colachel in 1741 leading to Marthanda Varma defeating of the Dutch East India Company which was the first loss of its kind by a European naval super-power in the Indian sub-continent. The House were signatories to the Treaty of Mavelikkara in 1753 contributing to the establishment of the Kingdom of Travancore, diminishing the role of the Dutch East India Company in the Indian subcontinent and leading to the rise of the Maharaja of Travancore Marthanda Varma and the Travancore Royal Family. At the age of 15 he joined M.D.Seminary School for high school studies. On April 20, 1898 he received minor orders and was sent to Madras Christian College for higher studies. There he obtained his master's degree. On 15 September 1908 Geevarghese was ordained priest by Vattasseril Mar Dinoysius. Just after the ordination Geevarghese was appointed Principal of M.D.Seminary, Kottayam. Later he moved to Calcutta, accepting an invitation to teach at Searmpore College. During his stay at Calcutta Geevarghese founded a monastic community. On Geevarghese's return from Calcutta a friend, E. John Vakeel, donated 100 acres (400,000 m2) of land at Mundanmala, Ranni-Perunadu, Kerala at the meeting place of the rivers Pampa and Kakkatt for an ashram. Geevarghese and his followers built a small thatched hut at what became the first Ashram in Malankara on 15 August 1919, named "Bethany". Along with the Ashram Geevarghese started a house for orphans. While at Serampore, Geevarghese founded the Bethany Madhom (convent) for women religious in 1925, with the help of the Epiphany Sisters of England working at Serampore. He was ordained a bishop of the Malankara Orthodox Syrian Church by Catholicos Beselios Geevarghese I on 1 May 1925. He received the name Geevarghese Mar Ivanios. On 20 September 1930 Mar Ivanios, Bishop Jacob Mar Theophilos, Fr. John Kuzhinapurath OIC, Dn. Alexander OIC, and Chacko Kilileth embraced and reunited with the Catholic Church. The Reunion Movement under the leadership of Mar Ivanios gave rise to Malankara Catholic Church. Pope Pius XI, through the Apostolic Constitution Christo Pastorum Principi of June 11, 1932, established the Syro-Malankara Hierarchy for the reunited community and erected the Archiparchy of Thiruvananthapuram with the Eparchy of Tiruvalla as its suffragan. The Metropolitan Eparchy of Thiruvananthapuram was established in 1933. Mar Ivanios was enthroned as its first Metropolitan Archbishop. The Eparchy of Tiruvalla was established in 1933. Jacob Mor Theophilos was enthroned as its first Bishop. In 1937 Joseph Mar Severios of the Orthodox Church reunited with the Catholic Church. In 1939, Thomas Mar Dioscoros, the Metropolitan of the Knanaya Jacobite Church, reunited with the Catholic Church. In 1938, the missionary congregation of the Daughters of Mary was founded at Marthandom in Kanyakumari District. Bishop Dioscoros died in 1943. Ivanios consecrated Benedict Mar Gregorios as his Auxiliary Bishop in 1953. Ivanios died on 15 July 1953. The Eparchy of Tiruvalla was led by Jacob Mor Theophilos and Joseph Mor Severios. Severios was the Administrator of the Eparchy until 1950 due to the ill health of Theophilos. In 1950 he was appointed as the Bishop of Tiruvalla. He was also invested with the title ‘Archbishop’. He died on 18 January 1955. In 1955 Metropolitan Archbishop Benedict Gregorios was enthroned as the Metropolitan Archbishop of Thiruvananthapuram and the Head of the Syro-Malankara Catholic Church. The Holy See appointed Zacharias Athanasios as successor to Severios, whose consecration took place in 1954. Jacob Mar Theophilos died in 1956. Francis Acharya, a Cistercian monk, came to the Eparchy of Tiruvalla. In the year 1957 he founded the Kristiya Sanyasa Samaj, Kurisumala Ashram in the high ranges of Vagamon. In 1958 the territorial boundaries of the Eparchy of Tiruvalla was extended north to include the Malabar region of Kerala, the civil districts of Coimbatore and Nilgiris and Karoor Taluk in Tiruchirappally District of Tamil Nadu and districts of Mysore, Mandya, Coorg, Hasan, Chickamangalore, Shimoga and South Kanara of Karnataka State. Mor Athanasios died in 1977. Paulos Mor Philoxenos, the Metropolitan of the Malabar Independent Syrian Church, was received into the Syro-Malankara Catholic Church on 28 August 1977. The appointment of Mor Isaac Yoohanon as Bishop of Tiruvalla and erection of the Eparchy of Bathery with the appointment of Cyril Mar Baselios as its first Bishop through the decree of the Holy See took place in 1978. Both prelates were consecrated that year. The Eparchy of Bathery was officially inaugurated in 1978. In 1979 the Eparchial contemplative monastery, Dhyana Ashram, was founded in the Eparchy of Bathery by Fr. Silvester Kozhimannil. Lawrence Mor Ephrem was consecrated Bishop in 1980. 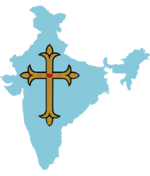 Malankara Catholics within India but outside the canonical territorial boundaries of the Church were first organized as Malankara Catholic Associations, and later came to be erected as personal parish communities. A coordinator was appointed to oversee them, by the Council of Hierarchs of the Malankara Catholic Church. St. Mary’s Malankara Major Seminary, the first local seminary, was inaugurated at Pattom in 1983 and the new building was blessed at Nalanchira, Thiruvananthapuram was blessed in 1989. Pope John Paul II visited on 8 February 1986 at St. Mary's Cathedral, Pattom, Thiruvananthapuram. On 28 April 1987, Mar Yoohanon, the Bishop of Tiruvalla died. Cardinal Lourdusamy, the then Prefect of the Congregation for the Oriental Churches, visited the Malankara Catholic Church in August 1987. Mor Geevarghese Timotheos succeeded Yoohanon as the Bishop of Tiruvalla. He was consecrated Bishop in 1988. Metropolitan-Archbishop Benedict Mor Gregorios died in 1994 after serving 41 years. Cyril Baselios, the Bishop of Bathery having been appointed by Pope John Paul II, was enthroned as Metropolitan Archbishop of Thiruvananthapuram and as the head of the Malankara Church on 14 December 1995. Geevarghese Mar Divannasios was consecrated Bishop of Bathery in the place of Cyril Mar Baselios on 5 February 1996. Achille Silvestrini, Cardinal Prefect of the Congregation for the Oriental Churches, visited the Malankara Catholic Church on 11, 12, 13 February 1996. On the request of Cyril Baselios, by an Apostolic Bull dated 16 December 1996, Pope John Paul II erected the Eparchy of Marthandom bifurcating the Metropolitan Eparchy of Thiruvananthapuram. Lawrence Mar Ephrem was appointed as its first Bishop. He died after a few months of his enthronement as Bishop of Marthandom, on 8 April 1997. In the meantime the Eparchy of Tiruvalla was blessed with an Auxiliary Bishop in the person of Thomas Mar Koorilos, who was consecrated Bishop on 17 July 1997. On 29 June 1998 Yoohanon Mar Chrysostom was consecrated as the Bishop of Marthandom and Joshua Mar Ignathios as the Auxiliary Bishop for the Metropolitan Eparchy of Thiruvananthapuram. Paulos Mar Philoxenos died on 3 November 1998. Christu Jayanthi Maha Jubilee and the Sapthathy of the Re-union Movement of the Syro-Malankara Catholic Church were celebrated jointly at Tiruvalla on 26, 27, 28 December 2000. In this period parishes for the faithful of the Syro-Malankara Catholic Church in the United States of America were established. Pope John Paul II nominated the Proto-Syncellus of Bathery Isaac Thottunkal, as Apostolic Visitor and the Auxiliary Bishop of Thiruvananthapuram on 18 June 2001 for the Syro-Malankarites residing in North America and Europe. He was consecrated on 15 August 2001 at Tirumoolapuram, (Tiruvalla), and assumed the name Isaac Mar Cleemis. Bifurcating the Eparchy of Tiruvalla, the Eparchy of Muvattupuzha was erected on 15 January 2003 and Thomas Mar Koorilos was appointed as its first Bishop. On 29 March 2003 Bishop Mar Timotheos resigned due to his age, and the Holy See appointed Isaac Cleemis, the Apostolic Visitor to Europe and America, as the Bishop of Tiruvalla. Cleemis took charge of the Diocese on 2 October 2003. On January 5, 2005 Joseph Mar Thomas was appointed as the Auxiliary Bishop of Thiruvananthapuram and Apostolic Visitor to North America and Europe. On February 10, 2005, the Syro-Malankara Catholic Church was raised to the status of a Major Archiepiscopal Church on that day by the papal document Ab ipso Sancto Thoma, and as such possesses a high level of autonomy under the Code of Canons of the Eastern Churches. Archbishop Pedro López Quintana, the Apostolic Nuncio in India, read the official declaration at St. Mary's Cathedral, Pattom, Thiruvananthapuram. The Hierarchical Head of the Church became a Major Archbishop who exercises patriarchal powers and governs the Church assisted by the Holy Synod of Bishops of the Church. The Catholicate Centre, which houses the Major Archiepiscopal Curia. On 19 February 2005, Joseph Mar Thomas was consecrated as Auxiliary Bishop of Thiruvananthapuram and Apostolic Visitor to North America and Europe. On 11 April 2005 the Faculty of Theology of St. Mary’s Malankara Major Seminary became affiliated to the Pontifical Urban University, Rome. The enthronement of the Major Archbishop as the head of the Syro-Malankara Catholic Church took place on May 14, 2005. The Malankara Major Archiepiscopal Curia (Catholicate Centre) started functioning at the St. Mary's Campus, Pattom, Thiruvananthapuram. On May 20, 2005, Cyril Baselios blessed the Curia building. Baselios soon constituted the first Synod of the Syro-Malankara Catholic Church, convened from 16 to 18 August 2005 at the Major Archiepiscopal Curia, Thiruvananthapuram. It constituted the Permanent Synod and the various Synodal Commissions headed by Bishops to take care of various apostolates of the Church. The official bulletin, Malankara is published from the Major Archiepiscopal Curia, to communicate the Synodal acts and voice of the Syro-Malankara Major Archiepiscopal Church. The Platinum Jubilee of the Reunion Movement and the Year of the Eucharist were celebrated jointly at Mar Ivanios Nagar, Punnamoodu, Mavelikara on September 19, 20, 21, 2005. By decrees of Baselios, the Metropolitan Province of Tiruvalla with the Eparchies of Bathery and Muvattupuzha as suffragans, was established on May 15, 2006 and Isaac Cleemis was appointed as the Metropolitan Archbishop of Tiruvalla. On June 10, 2006 Isaac Cleemis was enthroned as the first Metropolitan-Archbishop of Tiruvalla. By the decree of Baselios, on January 1, 2007, the new Eparchy of Mavelikara was erected and Joshua Mar Ignathios, the Auxiliary Bishop and protosyncellus of the Major Archdiocese of Thiruvananthapuram, was appointed as its first Bishop. The Second Ordinary Holy Episcopal Synod was convoked on December 6–7, 2006 and it was decided to revive monastic consecration according to the tradition of the Antiochene Church, properly termed Rabban per the Syriac, but locally called Ramban; and Corepiscopo, to honour a number of priests for their meritorious service in the Church. On Thursday, January 18, 2007, Cyril Baselios died, and was entombed by the side of his predecessors at St. Mary's Cathedral, Pattom, Thiruvananthapuram on January 20, 2007. Isaac Cleemis was elected the Major Archbishop of the Syro-Malankara Catholic Church through the first Episcopal Synod of election of the Syro-Malankara Catholic Church held on February 7–10, 2007 at the Catholicate Centre, Pattom, Thiruvananthapuram. Pope Benedict XVI confirmed the election on 9 February and it was announced on 10 February at St. Mary's Cathedral, Pattom, Thiruvananthapuram. The installation of Aboon Mor Joshua Ignathios was held on 16 February 2007 at Mavelikara and Aboon Geevarghese Mar Divannasios, the Administrator of The Malankara Catholic Major Archiepiscopal Church presided over the installation ceremony. The new eparchy has a 30,825 Syro-Malankara Catholic faithful of a total population of 2,998,325 inhabitants. Of this 269,849 are Malankara non-Catholics and 598,824 Christians of other denominations. On February 7, 2007, Pope Benedict XVI appointed Fr. Chacko Aerath OIC as the Apostolic Visitor with Episcopal status for the Malankara Catholic faithful residing in the Extraterritorial Regions of the Church within India. Baselios Cleemis was enthroned as the Major Archbishop of the Syro-Malankara Catholic Church on March 5, 2007 at St. Mary's Cathedral, Pattom, Thiruvananthapuram. On March 26, 2007 the Aboon Thomas Mar Koorilos was appointed the Second Metropolitan Archbishop of the Archieparchy of Tiruvalla. His installation Ceremony was held on May 2, 2007 at St.John’s Cathedral, Tiruvalla. Major Arch-bishop Cleemis was the main celebrant. Baselios Cleemis visited Pope Benedict XVI on May 28, 2007 at Vatican and exchanged ecclesiastical Communion. On July 14, 2007 Major Archbishop Baselios Cleemis declared Archbishop Mar Ivanios a Servant of God. In accordance with the provisions of CCEO can. 1063 the Ordinary Tribunal of the Syro-Malankara Catholic Church was constituted on November 15, 2007. Aboon Abraham Mar Julios, Ph.D. was consecrated Bishop of the Eparchy of Moovattupuzha by Baselios Cleemis on February 9, 2008 at Moovattupuzha. Baselios Cleemis blessed the newly built Tomb Chapel of the Servant of God Mar Ivanios in St. Mary's Cathedral, Pattom, Thiruvananthapuram on July 1, 2008. Leonardo Sandri, Cardinal Prefect of Congregation for the Oriental Churches visited the Syro-Malankara Catholic Church on November 10, 2008. Holy Qurbono according to the Syro-Malankara Tradition was celebrated. Baselios Cleemis was the main celebrant. In the following meeting Cardinal Sandri recognized Queen of Peace Pro-Cathedral at Palayam, Thiruvananthapuram as a Basilica. Cleemis dedicated St. Mary, Queen of Peace Basilica on December 7, 2008. Cleemis created two new Eparchies in the Syro-Malankara Catholic Church, Pathanamthitta in Kerala and Puthur in the State of Karnataka. He appointed four new bishops, elected by the Holy Episcopal Synod. He announced the transfer of Bishop Yoohanon Mar Chrysostom, later Bishop of Marthandom, to the new See of Pathanamthitta and Bishop Geevarghese Mar Divannasios from the See of Bathery to the new See of Puthur. Joseph Mar Thomas, the Apostolic Visitator to North America and Europe was appointed Bishop of Bathery. To the See of Marthandom, vacant due the transfer of its Bishop, was appointed Vincent Kulapuravilai, Professor and Registrar of St. Mary's Malankara Seminary Thiruvananthapuram. Samuel Kattukallil, Syncellus of the Major Archeparchy of Thiruvananthapuram and Stephen Thottathil, Dean of the Faculty of Theology of St. Mary's Malankara Seminary were appointed Auxiliary Bishops of the Major Archeparchy of Thiruvananthapuram and the Archieparchy of Tiruvalla respectively. Antony Valiyavilayil, the Postulator of the Cause of Canonisation of Servant of God Archbishop Mar Ivanios and the Chancellor of the Major Archiepiscopal Curia, was appointed the Bishop of the Curia. Thomas Naickamparampil was appointed as the first Exarch of the Syro-Malankara Catholic Exarchate in the United States by Pope Benedict XVI, with consultation by Cleemis and the Holy Synod of Syro-Malankara Catholic Church, on 14 July 2010. He was ordained bishop and received the name Aboon Thomas Mor Eusebius on 21 September 2010 at St. Mary's Malankara Syrian Catholic Cathedral, Thiruvananthapuram. His installation ceremony was on October 3, 2010 at Kellenberg Memorial High School, Uniondale, New York. Baselios Cleemis was elevated to the College of Cardinals of the Catholic Church by Pope Benedict XVI at the Papal Basilica of Saint Peter in the Vatican on 24 November 2012. As Cardinal-Priest he was assigned the titular church of San Gregorio VII. He is the first bishop of the Syro-Malankara church and the fifth Keralite becoming cardinal. The Syro-Malankara Catholic Church is fast growing in theological and canonical studies. Many authors have contributed to the development in the field of theology and canon law. Besides the canonical institutions of the Syro-Malankara Catholic Church, various associations including the Malankara Catholic Youth Movement (MCYM), the Malankara Catholic Association (MCA), and the Legion of Mary, Matruvedi, Pithruvedi emerged. The Syro-Malankara Catholic Church engages in humanitarian activities. One example of such services is Thapovanam, Shelter of Hope, Sulthan Bathery, a centre for the rehabilitation of the mentally ill. According to the Pontifical yearbook Annuario Pontificio for 2012, the Syro-Malankara Church had approximately 436,870 members. The liturgy of the Syro-Malankara Catholic Church is of the Antiochene Rite, West Syriac in character. The liturgy today is celebrated in Malayalam, Syriac, English, Tamil, and Hindi. The church uses one of several Bible translations into Malayalam. There are 39 Syro-Malankara communities in North India, including churches at Banglore, Chennai, Kolkata, Delhi, Mumbai, Pune and Hyderabad. On March 26, 2015, Cleemis and the Holy Synod in consultation with Pope Francis erected two Eparchies to cover all of India. Bishop Barnabas Jacob was appointed bishop of the Delhi-based Eparchy of St John Chrysostom of Gurgaon. Bishop Anthonios Thomas heads the Apostolic Exarchate of St Ephrem of Khadki. In July 2010, Pope Benedict XVI erected an apostolic exarchate for Syro-Malankara Catholics in the United States, and appointed Father Thomas Naickamparampil, then head secretary general of the major archiepiscopate of the Syro-Malankara Church, as first apostolic exarch of the new exarchate. The bishop-elect was ordained to the episcopacy on 21 September 2010 at St. Mary's Malankara Syrian Catholic Cathedral, Pattom receiving the name "Aboon Thomas Mor Eusebius" and the Enthronement Ceremony in the United States was held on October 3, 2010 at Kellenberg High School, Uniondale, New York. In July 2010 Pope Benedict XVI also appointed Thomas Eusebius as Apostolic Visitor for Syro-Malankara Catholics in Canada and Europe, alongside his primary work as Apostolic Exarch of the above-mentioned newly created Syro-Malankara exarchate in the U.S. There are Syro-Malankara parishes and communities in Canada, Germany, Ireland, Italy, Switzerland, and the United Kingdom. Thirteen Syro-Malankara communities are present in Bahrain, Kuwait, Oman, Qatar, and the United Arab Emirates. Because parishes (Qatar has parish) have not yet been organized, as the Syro-Malankara does not have ecclesiastical jurisdiction in the Middle East, the people are under the direct supervision of the Roman Catholic Apostolic Vicariates of Northern Arabia and Southern Arabia. Malankara Catholics of Abu Dhabi launched one of the early websites for the Syro Malankara Catholic Church before any official sites were existing and the first in the middle east. Now almost all communities in the Gulf have their own websites. Recently Rev. Fr. Mathew Kandathil, a Syro Malankara priest serving in UAE, in the Apostolic Vicariate of Southern Arabia, is appointed the Coordinator of the Malankara Catholic Faithful in the Middle East. He has to oversee the pastoral engagement of the Syro-Malankara Priests and coordinate the pastoral activities of common interest in the Gulf Region" relates Malankara, the official Communiqué of the Syro Malankara Catholic Church regarding this new appointment. The Malankara Catholic Educational Society manages various ecclesiastical, charitable, and educational institutions. Baselios Cleemis is the President and Samuel Mar Irenios the Vice Chairman of Malankara Catholic Educational Society. Malankara Catholic Youth Movement (MCYM) is the official organization for the youth in Syro-Malankara Catholic Church. The Catholic Youth Movement of Kerala dates back to the second half of the 1960s. Although there were some youth organisations in the parish level at different parts of Kerala, the spread of the organization of the youth movements in the diocese took place rather late. Two reasons seems to be of prime importance for the foundation of the youth organizations in the late 1960s. Founded in 1989, the Malankara Catholic Association is the association of lay faithful of the Church. Baselios Cleemis is the patron; there are now diocesan sections in the Thiruvananthapuram, Thiruvalla, Bathery, Moovattupuzha and Marthandom Dioceses and in North America. The official name of the church is Syro-Malankara Catholic Church which is mainly used in the English speaking Western regions. The name of the church as translated from Malayalam/Syriac is Malankara Syrian Catholic Church. ^ George Menachery (1973) The St. Thomas Christian Encyclopedia of India, Ed. George Menachery, B.N.K. Press, vol. 2, ISBN 81-87132-06-X, Lib. Cong. Cat. Card. No. 73-905568; B.N.K. Press – (has some 70 lengthy articles by different experts on the origins, development, history, culture... of these Christians, with some 300 odd photographs). ^ Roberson, Ronald. "The Syro-Malankara Catholic Church". E Catholic Near East Welfare Association. Retrieved 2 August 2018. ^ a b Eugene Cardinal Tisserant, "Eastern Christianity in India"
^ Rajan, Matthew (2004). "H.H. Baselios Geevarghese I - Second Catholicose". The Christian Light of Life. 3 (12): 221–225. ^ "Annuncio di Concistoro per la Creazione di Sei Nuovi Cardinali" (in Italian). Holy See Press Office. 2012-10-24. Archived from the original on 2013-02-23. ^ "The classified Bibliography of Fr. Dr. Thomas Kuzhinapurath" (in English and Malayalam). Scribd.com. 2014-09-15. ^ "Population Statistics". , Syro Malankara Church. ^ Ronald Roberson. "The Eastern Catholic Churches 2012" (PDF). Catholic Near East Welfare Association. Retrieved Nov 18, 2012. Information sourced from Annuario Pontificio 2012 edition. ^ "The Statutes from St. Mary, Queen of Peace Syro-Malankara Catholic Eparchy in USA and Canada website". , Syro Malankara Church. ^ a b "New Apostolic Exarchate for Syro-Malankara Church". ZENIT News Agency. July 14, 2010. Archived from the original on June 7, 2011. ^ "St. Mary's Malankara Catholic Church (Doha, Qatar)". Retrieved July 15, 2010. The Syro-Malankara Catholic Major Archiepiscopal Church Directory, Thiruvananthapuram, 2006. Arya Bharati High School is a high school in Omallur, Pathanamthitta, Kerala, India. The school is operated by the Syro-Malankara Catholic Church. Both the English language and the Malayalam language are used in instruction. Moran Mor Baselios Cleemis Thottunkal (Malayalam: ബസേലിയോസ് ക്ലിമ്മീസ്) is the current Major Archbishop of the Syro-Malankara Catholic Church. He was named to the College of Cardinals of the Catholic Church by Pope Benedict XVI on 24 November 2012.At the moment of his selection, he was the youngest member of the College of Cardinals. He is the first cardinal of the Syro-Malankara Catholic Church. On 31 January 2013, he was named a member of the Congregation for the Oriental Churches and the Pontifical Council for Interreligious Dialogue. He served as the President of the Catholic Bishops' Conference of India from 2014 to 2018. He has previously served as Chairman of the Kerala Catholic Bishops' Council. The Congregation of the Sisters of the Imitation of Christ (SIC) or Bethany Madhom is a congregation in the Syro-Malankara Catholic Church. It was founded by the Servant of God Archbishop Mar Ivanios on 01 May 1925 in the Malankara Church. The whole congregation re-united with the Catholic Church in 1930 following the reunion movement. The Major Archbishops of Thiruvananthapuram is the head of the Major Archdiocese of Thiruvananthapuram in Thiruvananthapuram, Kerala, India. The Major Archbishop, a position equivalent to Patriarch and locally called as Head & Father of Syro-Malankara Catholic Church. On February 10, 2005, the Syro-Malankara Catholic Church was raised to the status of a Major Archiepiscopal Church on that day by the papal document Ab ipso Sancto Thoma, and as such possesses a high level of autonomy under the Code of Canons of the Eastern Churches. Archbishop Pedro López Quintana, the Apostolic Nuncio in India, read the official declaration at St. Mary's Cathedral, Pattom, Thiruvananthapuram. The Hierarchical Head of the Church became a Major Archbishop who exercises patriarchal powers and governs the Church assisted by the Holy Synod of Bishops of the Church. The title “Catholicos” is used according to the Antiochene-Malankara Tradition in referring to the "Major Archbishop" (a term recently adopted by the Latin Church to refer to Eastern bishops equal to patriarchal authority, without an historical Patriarchate).The Father and Head of the Syro-Malankara Catholic Church, Baselios Cleemis was elevated to the College of Cardinals of the Catholic Church by Pope Benedict XVI at the Papal Basilica of Saint Peter in the Vatican on 24 November 2012. As Cardinal-Priest he was assigned the titular church of San Gregorio VII. Malankara Syrian Catholic College, Mariagiri, Tamil Nadu, India is owned and managed by the Eparchy of Marthandam of the Syro-Malankara Catholic Church, with the approval of the government of Tamil Nadu, and is affiliated to Manonmaniam Sundaranar University, Thirunelveli. It started in 1998, offering three undergraduate programmes in discipline Biochemistry, Computer Science and Physics. The college was inaugurated by Moran Cyril Mar Baselios Catholicos, Major Archbishop of the Syro-Malankara Catholic Church. It is one of the development activities initiated by its first Bishop Lawrence Mar Ephraem. The foundation stone was blessed by Achile Cardinal Silvestrini (Prefect of the Congregation for the Oriental Churches), and laid by Msgr. Maria Arputham, (Administrator, Diocese of Marthandam), the efforts of members of Marthandam Diocese, especially Fr. Prem Kumar M.S.W., Secretary and Correspondent of the college and his team. The college, dedicated to 'Our Lady of Annunciation', was blessed on 20 July 1998 by Yoohanon Mar Chrysostom, the present Bishop of Marthandam Eparchy. It serves the border areas of Tamil Nadu and Kerala. The college was accredited by the National Assessment and Accreditation Council (NAAC) with B+ grade in 2004. The college has ISO 9001 - 2000 certification. The motto of the college is "Learn to Serve"
Malankara Catholic Youth Movement (മലങ്കര കത്തോലിക്കാ യുവജന പ്രസ്ഥാനം ) is an association of youngsters of the globally spread Syro Malankara Catholic Church, which focuses on the development of the Youths, Church and the society. MCYM is working at the Unit, Regional and Diocesan level & Church level. Pushpagiri Medical College, Thiruvalla, Kerala, India is run by Thiruvalla Archieparchy of the Syro-Malankara Catholic Church. At present, it is a 900-bed multi disciplinary super speciality hospital. The Hospital has a very humble origin started as an eight-bed clinic in 1959. The hospital was raised to the status of a teaching hospital in 2002. The hospital was certified with ISO 9001:2000. The hospital is working with the following Departments: General Medicine, Cardiology, Psychiatry, Dermatology, TB & Chest, Gastroenterology, Neuro Medicine, Pediatric Surgery, General Surgery, Orthopedics, Physical Medicine, ENT, Ophthalmology, Pediatric Medicine, Urology, Nephrology, Neuro Surgery, Plastic Surgery, Multispecialty Dental Clinic, Obstetrics & Gynecology, Radiodiagnosis, Medical & Surgical Oncology, Transfusion Medicine, Anaesthesiology, Emergency & Trauma care, Pain and Paliative Care, Diabetology & Endocrinology. The Medical Education Institutions under this Hospital are Pushpagiri College of Medicine, Pushpagiri College of Pharmacy, Pushpagiri College of Nursing, Pushpagiri College of Dental Sciences and Pushpagiri College of Allied Health Sciences. The Principal of the Institution is Dr.T. P. Thankappan, Professor & Head of Department of Dermatology. Sacred Heart Malankara Syrian Catholic Church or referred as S H Church is located in the village of Mylapra, near Pathanamthitta on the road side of the Main Eastern Highway in the Indian state of Kerala. It is home to one of the oldest Malankara Syrian Catholic group. This is the biggest and oldest established church in the Eparchy of Pathanamthitta. This church is the patron for the Educational Institutions namely, Mount Bethany EHSS and S H Higher Secondary School. St. Aloysius Minor Seminary is the minor seminary of the Syro-Malankara Catholic Church in Trivandrum, Kerala, India. It is situated at Kesavadasapuram, Trivandrum. This seminary was founded by the servant of God Archbishop Mar Ivanios on 21 June 1934. The seminary started working in a temporary building adjacent to the Little Flower Parish Church, Patton. In 1938 it was shifted to the Archbishop Mar Ivanios's residence. The seminary remained at St. Mary's Cathedral campus for a long time. In 2007 the seminary was shifted to Mar Ivanios vidya nagar, Nalanchira. 2013 it was again shifted to Kuravankonam. From 2016 the seminary functions at Kesavadasapuram. The seminary offers priestly training for Minor Seminarians of the Major Archeparchy of Trivandrum. Fr. Dr. John Kuttiyil is the Rector of the Seminary.At present there are -- brothers, one spiritual father namely Rev.Fr Varghese Plavila. Rev. Fr. Jacob Elampalloor serves as the Procurator of the seminary.Minor seminary course extends for a period of four years and the then they will go to Major Seminary. St. Ephraem Ecumenical Research Institute (SEERI) is a centre for Syriac studies based in Kerala, India. St. Mary's Malankara Syrian Catholic Cathedral, Pattom, Trivandrum is the central place of worship of the Syro-Malankara Catholic Church. It is the See of the Major Archbishop-Catholicos of Trivandrum. The tombs of the Servant of God Archbishop Geevarghese Mar Ivanios, Archbishop Benedict Mar Gregorios and of Major Archbishop Cyril Baselios Catholicos are there. The foundation stone of this Cathedral was laid by Archbishop Mar Ivanios in 1950, and the Cathedral was consecrated by Archbishop Benedict Mar Gregorios on 22 February 1965. Pope John Paul II visited the Cathedral on 8 February 1986. The Cathedral was renovated in 2008. The blessing of the renovated Cathedral was on 8 November 2008. There were 531 families in the parish community. The St. Mary, Queen of Peace Basilica, located in the Palayam/Cantonment area of the city of Thiruvananthapuram, in the state of Kerala, India, is the first Syro-Malankara Catholic Church to be elevated to the rank of a Catholic basilica. It is the fifth basilica in Kerala. On 10 November. 2008, at the St. Mary's Cathedral, Pattom, Trivandrum, Leonardo Sandri, Papal representative and Cardinal Prefect of the Congregation for the Oriental Churches, announced the designation of the Queen of Peace Pro-Cathedral in Thiruvananthapuram as a basilica. Major Archbishop Moran Mor Baselios Cleemis Catholicos dedicated the church as the St. Mary, Queen of Peace Basilica on 7 December 2008. Kerala Minister M. Vijayakumar presided over a meeting that followed. St John's College is one of the higher educational institutions of the Syro-Malankara Catholic Church. The college is situated at Anchal, Kerala, India. It is one of the Malankara Syrian Catholic colleges established and administered by the Major Archdiocese of Trivandrum in accordance with the rights of the minority community guaranteed in the Constitution of India. This estimated centre of learning is the result of the vision of late Archbishop Benedict Mar Gregorios and is currently flourishing under the patronage of Moran Mor Baselios Cleemis. Ever since its inception, the college is championing the cause of learning and total development of the region. The college is re-accredited by NAAC at A grade in May 2015. It is the third college in Kollam district to receive an A grade. The College, affiliated to the University of Kerala, was started in 1964 with pre-degree course and upgraded successively with B.A, B.Sc and B.Com Degree courses in 1967, M.Sc Mathematics in 1995, B.A. Communicative English (Semester) in 1998, M.A. Public Administration (Semester) in 1999, and M.Sc Environmental Science (Semester) in 2001. While being conscious of its special obligations for providing educational opportunities to the Malankara Syrian Catholics community, the management also extends its service to the members of other communities as well. The college made its social media presence through Facebook and Twitter in late 2011. Since then, it has been providing updates through website and social media. On 13 September 2014, the college celebrated its Golden Jubilee by hosting a mega reunion day at the campus. The event attracted many of its former students and staff to take a walk down the memory lane. Cultural and art programmes were organised and conducted by the alumni at the college auditorium. Pooja Vijayan, with her semi-classical dance, was one among the numerous alumni who performed on the occasion. The Syro-Malankara Catholic Eparchy of St. Mary, Queen of Peace, of the United States of America and Canada is the North American eparchy for the Syro-Malankara Catholic Church of the Catholic Church. The Syro-Malankara Church observes the Antiochian Rite in the Syriac language. The secretary is a man named Philipose Mathew. It is immediately subject to the Major Archbishop of Trivandrum, and is not part of an ecclesiastical province. Its Cathedral episcopal see is the St. Vincent de Paul Malankara Cathedral (previously St. Vincent de Paul Syro-Malankara Catholic Cathedral Parish), in Elmont, New York. Bethany Ashram is a monastic order in the Syro-Malankara Catholic Church. It was established by Archbishop Geevarghese Mar Ivanios. The Ashram follows the religious order called Order of the Imitation of Christ (O.I.C. ), which is derived from the Catholic devotional book called The Imitation of Christ by Thomas à Kempis.